The Squeezit Mold Painter is a very useful tool in the creation of molded chocolates. The tool allows you to squeeze or place colors of chocolate into the molds giving you the ability to make multicolored chocolates. 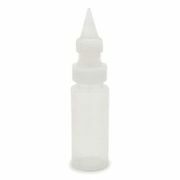 It comes with a small holed plastic tip but any standard size tip can be used. CK Products manufactures this product.